Welcome to the Paradise reserve website. To visit the reserve, please submit an online application. 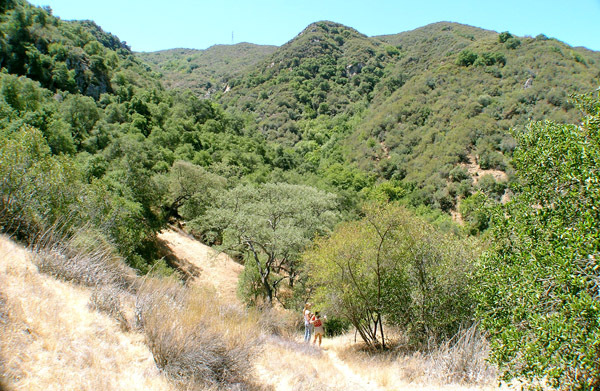 "The Paradise Reserve is a privately owned natural area on the north facing slope of the Santa Ynez Mountain, CA, created to foster research and awareness of the Santa Ynez Mountain ecosystem." Aerial view of the Paradise reserve (red line). The yellow line is the USFS service road to access the reserve. 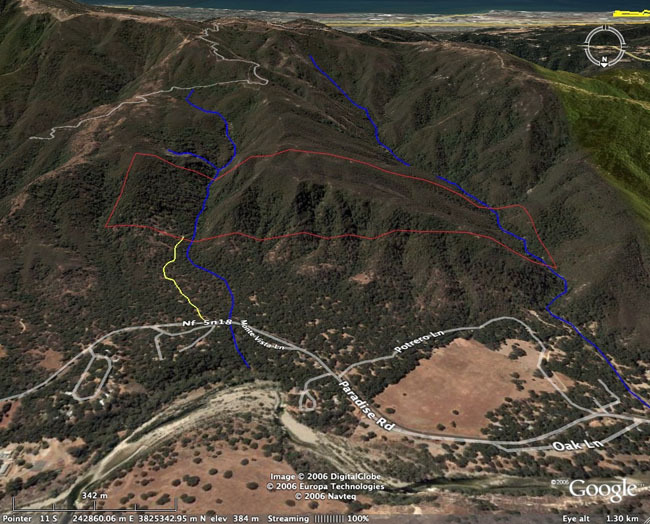 The blue lines are the Cielo Creek, on the left, and Paradise Creek, on the right. Santa Ynez River is in the foreground. The Paradise Reserve was established in 2005 by biologists Cristina Sandoval and Kevin Lafferty. Why create an ecological reserve in the middle of the Los Padres National Forest? We hope that by creating a reserve with the specific purpose of attracting researchers, the Santa Ynez Mountain ecosystem will be better understood. It all started In 1988, when Cris Sandoval, then a graduate student at UCSB, was searching for an insect that would be suitable for studying natural selection, the topic of her PhD dissertation. While searching in the chaparral shrubs, the most common insect that fell inside of her butterfly net, was an unusual walking-stick. Cris sent this insect to a walking-stick specialist in Canada, Dr. Vernon Vickery, and learned that it was a new species of walking-stick. Dr. Vickery named it Timema cristinae. This insect became the subject of her research carreer to this date. She was surprised to learn that a common species of insect in a mountain so close to UCSB campus was still unknown to scientists. Although scientists have developed a great understanding of ecological and evolutionary theory, we know little about California's ecosystems. We don't know most of the species that live in them, and even less what these species, particularly the insects, do in their environment. Knowledge of basic natural history of species and their habitats is an essential tool to protect them from the danger of extinction. People love what they know and protect what they love. Thus science, education, and conservation are tightly linked and dependent on each other. We hope that the Paradise Reserve will attract biologists, geologists, amateur birders, etc, to visit and use their expertise to help us understand the Santa Ynez Mountain and its geological history, habitats, and species. The canyon along Cielo creek has a dense riparian vegetation. Above the creek, the slopes transition to oak woodland and then to chaparral at the top of the hills. Areas without trees support native grasslands and a variety of native wildflowers. There are no facilities on site. Camping at a designated site is possible. However, due to the high fire danger in this area, campfires are not allowed. County campgrounds exist within one mile of the Paradise Reserve. The US Forest Service Los Prietos Ranger Station is only one mile away. View from the northern end of the Paradise Reserve. The flat oak woodland below is property of the Los Padres National Forest. Several campgrounds exist along Paradise Road. Santa Ynez River runs east-west along this valley. Note the green vegetation growing in the north facing slope (left) and the drier habitat on the south facing slope (right).